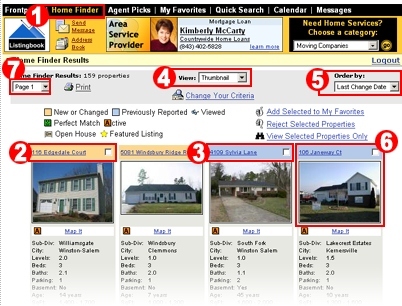 Listingbook is a powerful tool that allows you to search all properties listed in the Multiple Listing Service. 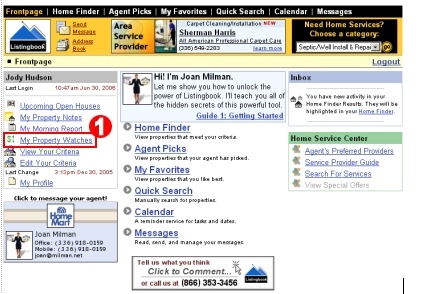 You have a client account that provides full access to all Listingbook features. 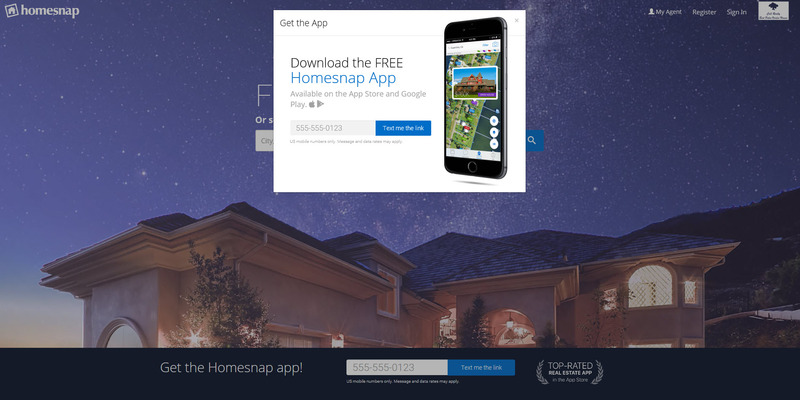 This lets you search the MLS just like real estate agents! You can get all photos, virtual tours, schools, area sales and loan calculator. Finding your dream home has never been easier! There are 11 tutorials in here, but be confident to jump right in to your account without viewing any of these lessons. 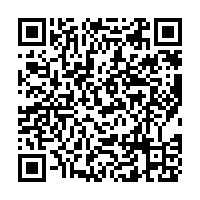 This is your Listingbook Frontpage that you can use to seach for Palos Verdes homes or real estate anywhere around the Southern California counties! 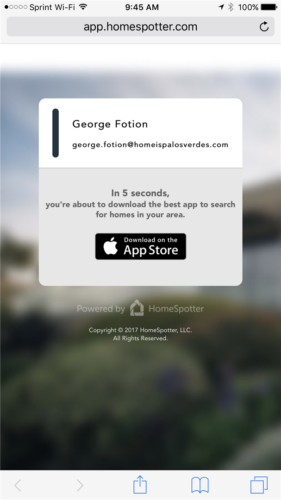 Home Finder — Monitors all MLS activity and displays up to date properties that match your criteria. 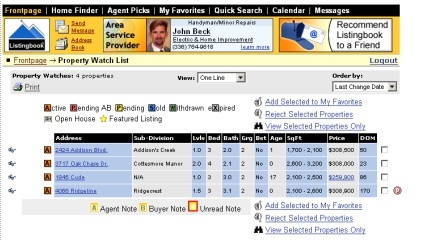 Agent Picks — Displays properties your agent thinks you might like that may or may not match your criteria. My Favorites — Displays properties you rated as your favorites. Calendar — A reminder service for tasks and dates. Messages — Read, send, and manage your messages. The menu bar ( 2 ) allows quick and easy access to Frontpage Menu services from anywhere in Listingbook. The history bar ( 3 ) shows you where you are in Listingbook and what steps you took to get there. 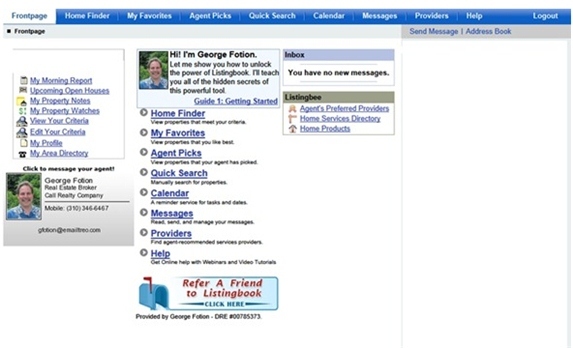 The Send Message ( 4 ) link lets you message your agent from anywhere in listingbook. The notification icons ( 5 ) flash when you have new property notes from your agent or new messages . Upcoming Open Houses — View open houses updated every day that match your key criteria. My Morning Report — View your most recent Morning Reports without using your email. 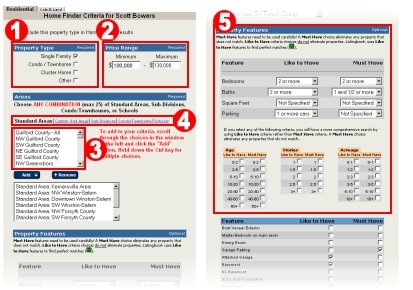 Edit Your Criteria — Used to change your Home Finder Criteria (see Changing Criteria section of this guide). My Profile — Change your email address or service options. The Inbox ( 7 ) notifies you of new information in your account. 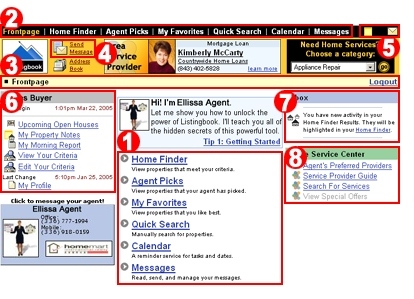 The Home Service Center ( 8 ) is a resource used to find home related services. It can also be used to get estimates if work is required on a home you might purchase. Listingbook’s Home Finder ( 1 ) is an easy way to track Palos Verdes homes or South Bay real estate that match your search criteria. The Home Finder works with your Morning Report to alert you of new or changed properties automatically. 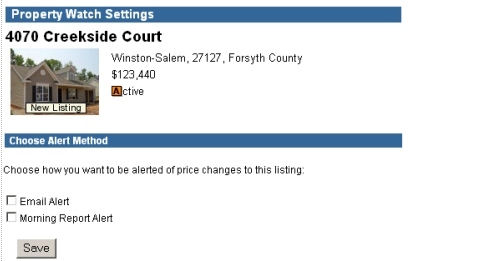 Recently listed and updated properties ( 2 ) appear at the top of your Home Finder and are highlighted in orange. Properties previously reported are highlighted blue ( 3 ). You can change the information and layout of the Palos Verdes homes and South Bay properties by changing the view type ( 4 ). View choices include One Line, Thumbnail (default), Portfolio, and Comparison. 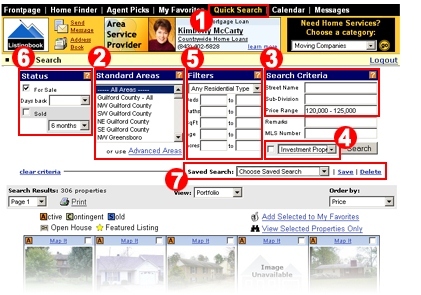 You can reorder the property list ( 5 ) over 16 different ways (subdivision, basement, age, rating, etc.) to make it easier to find properties with specific features. Complete property details can be accessed from every view by clicking the address or photo ( 6 ). Try to avoid making assumptions on a property based on first impressions. Get the details and make an educated decision before you rule a property out. Your Home Finder can have hundreds of properties in it. Use the page pull down ( 7 ) at the top or the navigation at the bottom (not shown) to switch pages. If you have too many properties, make your criteria more specific. If you have too few properties, make your criteria less specific. Changing your criteria is covered in the next section. 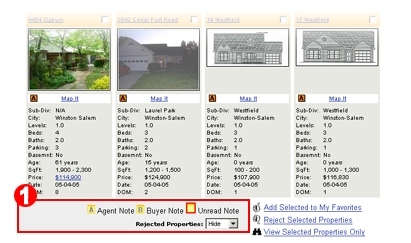 You can change your Home Finder criteria by clicking “Edit Your Criteria” from your Frontpage or from your Home Finder. Make sure your property types ( 1 ) and minimum and maximum price ( 2 ) reflect the type of home you are seeking. Add up to 25 different areas by selecting an area ( 3 ) and clicking the “Add” button. You may also add areas by multiple map areas, sub-divisions, condo/townhomes, and schools by clicking on the different area types ( 4 ). Select Property Features ( 5 ) carefully. A Must Have choice eliminates any property that does not match. A Like to Have choice is used to determine perfect matches . Don’t select too many Must Haves…learn what is out there first. Click the “Save” button when you’re done. You can edit your criteria at any time. If you’re not finding the homes you’re interested in, double check your criteria or message me for assistance. 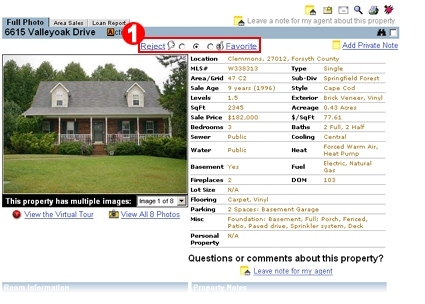 When you click on any address or photo, you are shown the Property Detail page. 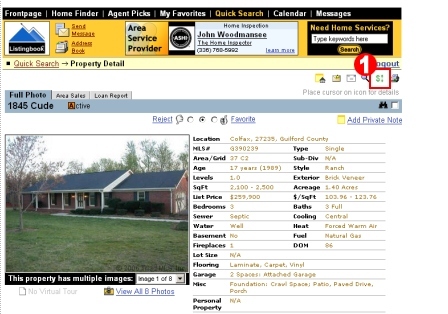 This page displays all available details of a property in an easy to read format. The address is displayed under the navigation tabs ( 1 ); these tabs are covered in more detail in the next section of this guide. Beneath the address are the photos with three optional links ( 2 ): Virtual Tours, View All Photos, and Open House Flyer (if an open house is scheduled). The property’s details ( 3 ) are displayed to the right of the photos. This section displays the more important features of a home including property type, age, square footage, acreage, list price, heating, air conditioning, and parking. Room Information or External Features ( 4 ) lists important rooms with location and dimensions to help determine if the home provides adequate living space. Additional features and information are indicated in the Remarks section of the Property Notes ( 5 ). You may also find directions to the property in this section. There are other optional sections not covered by this guide including Public Schools and Tax Information. The Property Detail page has many tools to help you determine if one of the Palos Verdes homes or South Bay properties is right for your needs. The “Map It” tool ( 1 ) displays the location of the property and surrounding area in an easy to read interactive map. 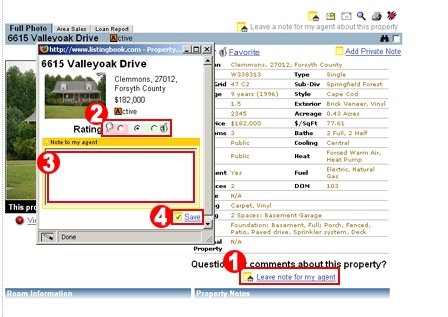 Use the other links ( 1 ) to print the property , send the property via Listingbook message , or email to a friend . Also notice that the Property Detail page has several other pages that have valuable information on them. 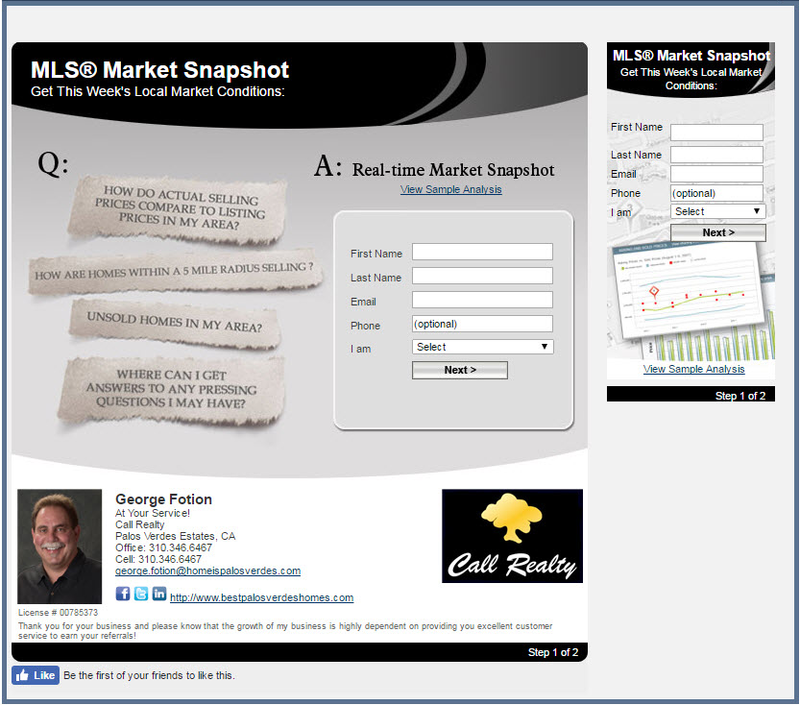 The Area Sales report ( 2 ) shows how this property compares to recently sold properties in the surrounding area. Use the Loan Report ( 2 ) to estimate downpayments and monthly expenses for the property. You can adjust the loan rate and price to perform a “what if” analysis. You may also add private notes ( 3 ) to properties. These notes are for your eyes only and will not be shared with anyone. Click on the radio button next to the thumbs-up or thumbs-down to rate the property ( 1 ). The page will refresh and the or icon will appear on the property. Click on Leave note for my agent ( 1 ). 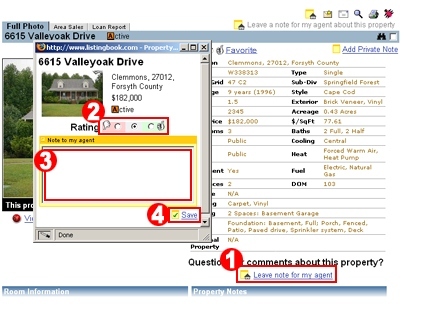 Click on the radio button next to the thumbs-up or thumbs-down to rate the property ( 2 ). Type your note in the box ( 3 ). Click on Save ( 4 ). The page will refresh and the note will appear above the Leave note for my agent link. Select the properties you want to add to your favorites by putting a check in the checkbox ( 1 ). Click on Add Selected to My Favorites ( 2 ). The page will refresh and the icon will appear on the properties you selected. To view favorites, click My Favorites from the menu bar. To hide rejects, change the Rejected Properties pull down from Show to Hide ( 1 ). To view rejected properties again, change the pull down to Show again. 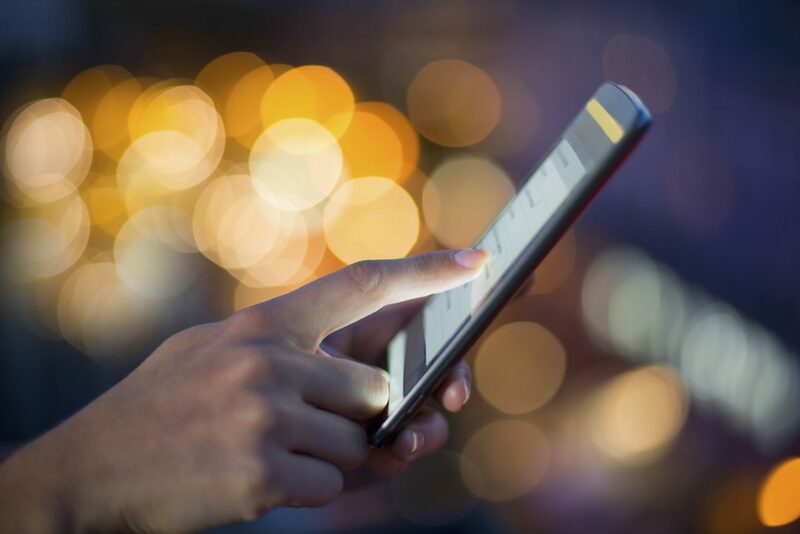 Leaving notes is an easy way to share information with your agent (or others sharing your account) regarding your favorites, rejects, and concerns about any of the Palos Verdes homes or South Bay properties. You can do it from any property detail page. Click on the radio button next to the thumbs-up or thumbs-down ( 2 ) to rate the property (optional). The page will refresh and the note will appear above the Leave note for my agent link ( 1 ). Property Watch is a service that lets you set alerts on Palos Verdes homes and South Bay properties for sale and alerts you whenever a watched property has a price change. Alerts can be sent via email and/or indicated in a special section of the next day’s Morning Report. 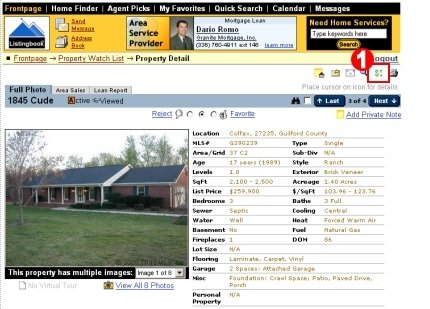 Any property for sale can be watched, even if it isn’t in your Home Finder or Favorites List. To set a Property Watch, navigate to the Property Detail page of the desired property for sale. You will see a green dollar-sign symbol ( ) displayed on the top right portion of your page ( 1 ). Click on the green dollar-sign symbol ( ) and you will see a pop-up like the one below. Check one or both of the checkboxes labeled Email Alert (for immediate notification) and Morning Report Alert (for notification in the next Morning Report). Then click Save button to complete the Property Watch. After clicking the Save button, you will see the following message. Click Close Window, as shown in the image below, to proceed. Whenever the price for this particular property changes, Listingbook will notify you, via email and/or your Morning Report, of the new price. To change or maintain your Property Watches, there is a new link labeled My Property Watches in your My Services menu on your Listingbook Frontpage ( 1 ). Click the My Property Watches link and you will see a page like the one below listing all of the Property Watches you have set up. If you wish to change the Property Watch settings for a property, click on the desired property address. This will bring up the Property Detail page for the selected property. You will see a green dollar-sign symbol ( ) ( 1 ) displayed on the top right portion of your page. 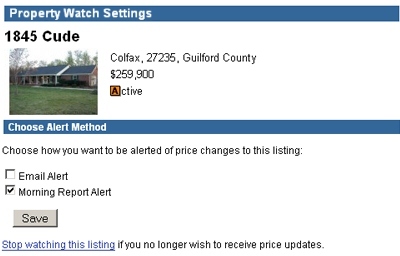 Click on the Property Watch icon ( 1 ) and you will see a pop-up like the one below. You may choose to either change the type of notification you are receiving by selecting a different combination of checkboxes and then click Save, or if you want the Property Watch turned off, click Stop watching this listing. If you clicked the Save button, you will see the following message. Click the Close Window button, as shown in the image below, to proceed. Or, if you clicked the link labeled Stop watching this listing, you will see the following message. Click the Close Window button, as shown in the image below, to proceed. We hope the Property Watch feature will assist you in your search and welcome your feedback on this or any other feature of Listingbook. While the Home Finder is busy finding homes that match your specific criteria, you can do your own custom searches with Quick Search ( 1 ). 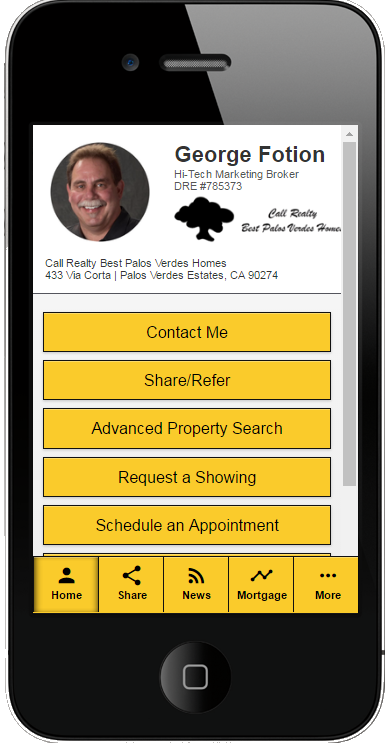 Quick Search is an easy way to search a specific area, sub-division, or street for Palos Verdes homes and South Bay properties you may be interested in. To start, select an area you would like to search from the Standard Areas ( 2 ) menu, then type in a Price Range ( 3 ). Quick search will return all properties in the area you select that are in your price range. You can control-click on the Standard Areas list to include mulitple areas. If you are interested in a particular sub-division, select your area of interest from the Standard Areas list and type the name of the sub-division into the Sub-Division field ( 3 ) of your Search Criteria. You can search a specific street the same way, by typing the street name into the Street Name field ( 3 ). You can also search for only investment properties by checking the checkbox for Investment Properties ( 4 ). Some searches will return an unwieldy number of properties. Use the Filters ( 5 ) to cut out properties that you aren’t interested in. 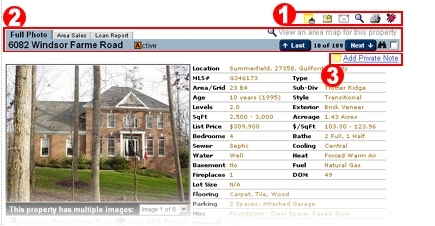 You can filter on Property Type, Bedrooms, Bathrooms, Square Footage, Age, and Acres. 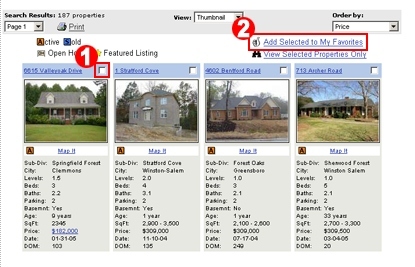 Listingbook will only allow searches of 1,000 properties or less, so use filters to cut out unwanted properties. You can change the status ( 6 ) of the properties in your search to include active or sold properties (client accounts only). Use the days back pull down to search for properties that have been listed within the number of days selected. You can also save Quick Searches for later use ( 7 ). Click the “Save” link to save your current search. You’ll be prompted with a Save As dialog to name your search; type in the name for your search and click “Save”. To visit an already saved search, just use the pulldown to select the search from your list. The Morning Report is a Listingbook service that provides a detailed summary of the activity that occurs during the previous day. This information is formatted in an easy-to-read report and emailed to you every morning there is new activity. If you delete your Morning Report email, you can access the current and previous Morning Reports by clicking on “My Morning Report” on your Frontpage. 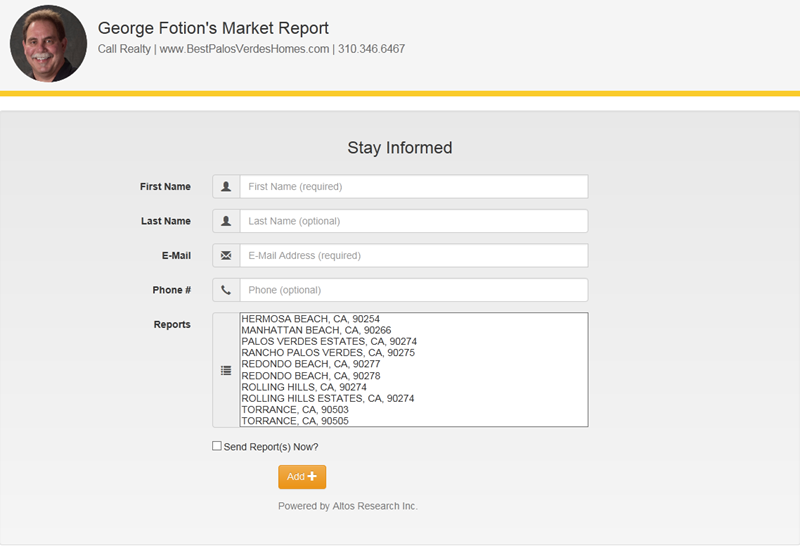 Home Finder Activity – Recently added or updated properties that match your Home Finder criteria for any of the Palos Verdes homes or South Bay properties. Unread Messages – Notifies you of unread Listingbook messages. 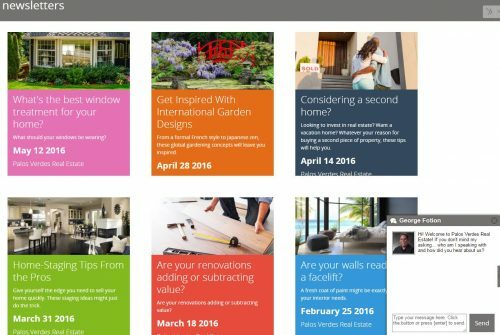 Favorites Activity – Notifies you of updates to your favorite properties. Open Houses – Informs you of Open Houses that match your key criteria that you can visit this week. 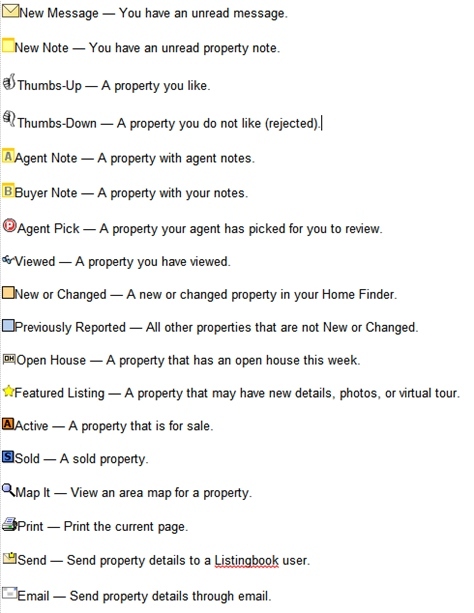 Agent Notes – Notifies you of new property notes from your agent. Calendar Activity – Alerts you of calendar items that are scheduled for today or tomorrow. Weather Report – A summary of today’s weather.